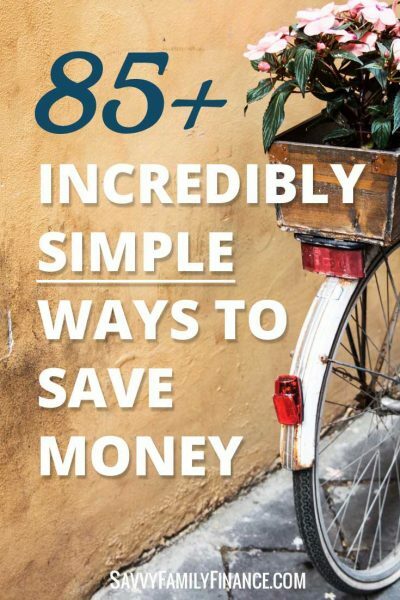 Inside: Saving money can be very simple and here you will find a list of ways you can save every day. We all want to stretch our dollar and have our money do more for us. 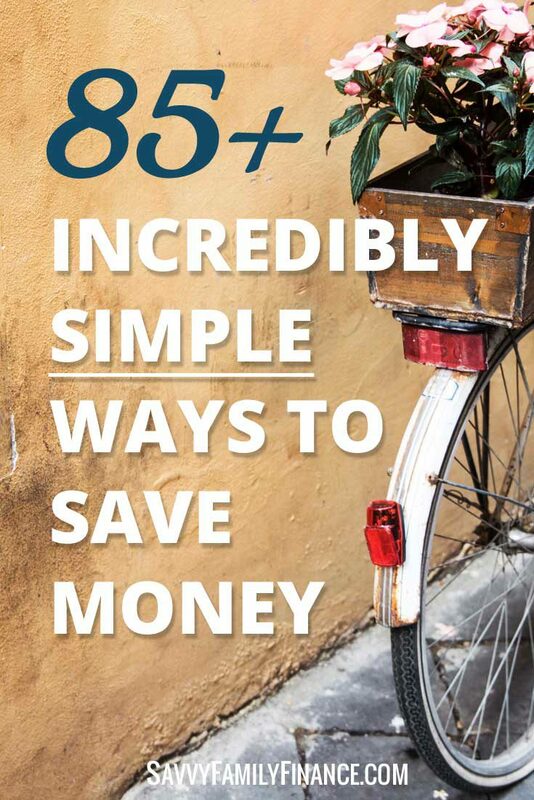 While we try to find simple ways to save money, we also don’t want to feel deprived. There is no fun in that. Below you will find tips for saving money in all sorts of situations. Most of these tips are easy to do, though some do require a bit more effort than others. Of course, not all these will apply to you, but some will. Read through the list and you might find some new ideas. Choose the best for your situation and use them. Go through your investments and check the management fees. Are you paying too much? Opt for low-cost ETFs or index funds. There are a lot of great options available, and there is no reason to be paying more than 1%, or even 0.5% in fees. If you are using a big bank, chances are you are earning next to nothing in interest on your accounts. By switching to a credit union or a high-interest online bank, you could earn upwards of 10x more interest on your accounts. Do your credit cards have interest rates that have been going up? If you are paying down a balance on the cards, give the company a call and request an interest rate deduction. The lower interest rate can save you a lot as you pay down the debt. If the issuer won’t reduce interest rates, consider transferring the balance to a 0% interest rate card. Then eliminate that debt before the 0% interest period expires. If you get your home and auto insurance from different companies, call them and ask about bundle rates. Issuers often offer discounts for multiple plans. An easy way to get an automatic “discount” on your spending is to use a cash back credit card. Use a card that offers a percentage back for each purchase and the savings will slowly add up. We even did this with our monthly daycare bill! Of course, only do this if you pay your bill in full each month. When you need to grab some cash, seek out ATMs that are in your banking network to avoid fees and surcharges. Does your bank charge you a fee just to keep a checking account open? Then it is time to change banks. Shop around for a credit union or high-interest online bank that offers free checking with no minimum balance. If you have private student loans at a high interest rate, you may want to consider refinancing your loan through an online lender such as SoFi or Earnest. Federal student loans have special protections that would be lost through refinancing, though. Enrolling in a health care flexible spending plan or HSA can save your family money on taxes. You can save money by buying the store brand of over-the-counter medications. They are likely just as effective and will save you quite a bit of money. When you need to fill a prescription, it pays to shop around. Some pharmacies and retail chains may charge significantly more than others for the same prescription. Give them a call and find out. Giving up a bad habit can save you hundreds of dollars. When you get your hospital or doctor bill in the mail, or even an insurance statement, check it over. You can save yourself and even the insurance company a lot of money by catching charges that shouldn’t be there. I was even once billed for a surgery that never happened! Maintaining your health is important. Check in with your healthcare provider for regular checkups. You may get a “thumbs up” or advice on changes you can make to improve your health before things get worse. Have an extra bedroom? Reduce the cost of housing significantly by getting a roommate. The size of houses has increased since you (or your parents) were kids, yet the average family size hasn’t gotten larger. You can save a lot of money by stopping efforts to keep up with the Joneses and instead buy a smaller house than you can afford. If you have a mortgage where the interest rate is higher than what is currently available, it may save you money in the long run to refinance at the new rate. Save on your electric bill by replacing incandescent bulbs with LED. The newer LED bulbs use a fraction of the electricity, can last over a decade, and don’t have mercury disposal issues that CFL bulbs do. You can save money on gas, parking, and wear-and-tear on your car by taking the bus, subway, or light rail. Use the time to catch up on news, social media, read a book, or learn a new language. Stay in shape and avoid traffic bottlenecks by riding your bike to work. Are you paying too much for insurance? Check with your insurer to see if you are eligible for safe driver or safety equipment deductions. Also, call around and see if a different insurer can provide the same coverage for less. Do you drive infrequently? You may benefit from not owning a car and just making use of car share services like Zipcar or car2go. Most cars are designed to run on regular gas, so save your money and don’t buy premium if your vehicle doesn’t require it. You’ll save money and your car will run just as well. Taking your car in for regular tune-ups and oil changes can save you a lot of money. Neglecting maintenance can lead to expensive repairs that could have been avoided. Check with your insurer and see how much you can save by increasing the deductible on your insurance. Going from a $500 to a $1000 deductible could save on your insurance bill. Just make sure you also have enough in your emergency fund to cover your deductible. Like biking, walking can improve your health while saving on gas. Rather than hopping into the car and driving a few blocks to the store, take a stroll. You can easily save hundreds of dollars each year by dropping your cable subscription. There are many alternatives that will keep you entertained. Are you still on a cell phone contract? Shop around for a new cell phone plan. There are many pay-as-you-go options that are very affordable now. Adjusting the thermostat so the house is a few degrees cooler in the winter and warmer in the summer can save a lot on your bill. Even better, get a programmable thermostat that will automatically adjust the temperature throughout the day. If you live in an older home, chances are your house could use more insulation. If so, adding more insulation will save not only on heating but on cooling your home. If you have children under 13 still in childcare, check to see if your employer offers a dependent care FSA (flexible spending account). This will let you use pre-tax money to pay some of your childcare costs. Often, a nanny will be as expensive as daycare. But if you have more than one child or can find another parent to share a nanny, it could save you quite a bit of money. Babysitters can be expensive. Try arranging a babysitting swap with another family so you can take turns going out without spending most of the night’s budget on babysitting. Planning your meals in advance saves you from the nightly “what’s for dinner?” conundrum and then wasting money on take-out. You’ll know what is for dinner and have the ingredients at hand. It’s no surprise that eating a meal prepared at a restaurant costs more than one cooked at home. Try reducing take-out to once a week, or even once a month. Many grocery stores have loyalty cards that can help you save money, often even an app you can install on your phone. Along with the store coupons, you can also make use of rebate apps such as Ibotta or Ebates for additional savings. When you see a good sale on essential items you often buy, then stock up if you have the shelf or freezer space. So if you see something like bread, meat, or even tissues on sale it is worthwhile to get a bit extra. Those capers you use twice a year? Probably not. Store brands of foods are usually just as good, and sometimes better than the well-known name brands available. Give store brands a try and you may find it is one of the easiest ways to save money on groceries. Getting lunch with your co-workers is great. But it likely is costing you $10+ each day. Try packing a lunch more often and use the savings to pay down debt or save up for something fun. Many grocery stores and some retail stores will give you a credit for bringing in a reusable bag. It may only be 5 cents per bag, but you’ll not only be saving money but reducing the amount of trash in the landfill. There are a lot of great bags available. We have some ChicoBags and Envirosax bags that are several years old and still going strong. Meat is likely one of the most expensive items on your grocery list. If you aren’t already vegetarian or vegan, going meatless at least part-time can reduce your grocery bill. Try browsing thrift stores and consignment shops for clothes. You can often find great bargains. Sometimes you will even find clothes with the original price tag still attached, meaning it was never even worn before. If you have been throwing out shirts with missing buttons or a hem that has come undone, you can save yourself money by learning how to do simple repairs. There are plenty of YouTube videos and websites giving instructions on how to do simple clothing repairs. Often all you need is a needle and thread. If your closets are like ours, things get piled up, pushed back, and forgotten. Once a season, go through your closets and drawers. Get rid of anything that doesn’t fit and rediscover gems that were buried and forgotten. Retailers want to make room for next season’s clothes, so will deeply discount out of season merchandise. Try shopping for winter coats and sweaters in mid-January and look for summer steals in August and September. Save yourself money and time by avoiding buying clothes that need special care such as dry-cleaning. Libraries are a wonderful source of entertainment. Check it out (pun intended) for free use of books, ebooks, movies, and sometimes even passes to museums. Check your community calendar for listings of free concerts, movies, and events in your area. Many local museums, zoos and aquariums offer either discount or free days once a month or even once a week. Call and ask. Even movie theaters will have discount days as well. When you go to a venue, ask about available discounts. Often there are reduced rates available to students, members of the military, or senior citizens. You can also ask about discounts for being a member of AAA or AARP and other organizations. Whether online, at yard sales or through a reseller, you can find great deals on used movies, books, and video games. Hopefully, you’ve found some new ideas here. All too often we pass up savings because we don’t know they exist or we don’t even bother. Trying just a few of these has the potential for making a positive impact on your budget and savings. We eat only vegan food in our household and it drastically cut our grocery spending. It’s funny because people think eating this kind of diet is expensive, but it’s not at all! I agree! Though we aren’t vegan/vegetarian, we’ve been making many more of those meals for health reasons and the financial benefits are a definite bonus.